Today would have been the 107th birthday of Pro-life President Ronald Reagan! Each year on the anniversary, for reasons I cannot explain, I always recall where I was the day he was shot. At the time I was working as a volunteer for a state affiliate of National Right to Life and actually heard about the shooting while I was in the car. I recall the range of emotions I felt as if it had happened yesterday. President Reagan survived and the cause for which we all work so hard benefitted enormously. The following is what I wrote on the occasion of President Reagan’s 100th birthday. For pro-lifers of a certain age, President Ronald Reagan will always be first in our hearts. It is possible to exaggerate his pro-life accomplishments, although that would be difficult. It is possible to overstate what a boost to our morale his presidency represented, although I greatly doubt it. However it would impossible to overstate the extent to which our 40th President altered the trajectory of the abortion discussion. What is often under-appreciated is the late President’s ken peripheral vision. Not content to merely look straight ahead, he clearly saw that if the abortion ethos was not contained, it of necessity would seek out new categories of victims. To the left, were the very young, born less than perfect. To the right were the medically dependent elderly. President Reagan took office almost eight years to the day after the Supreme Court unleashed the abortion juggernaut in its grotesque Roe v. Wade decision. President Reagan’s administration began the journey that you and I are on today–a journey that recalls us from out of the darkness and into the light. 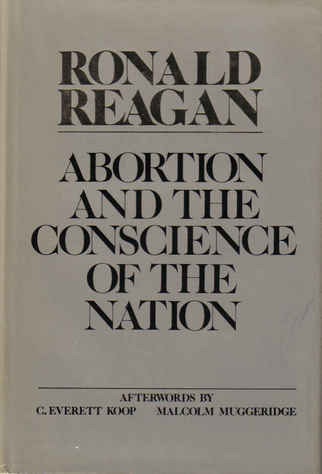 Among pro-lifers, President Reagan may best be remembered for writing a small but pivotal book: “Abortion and the Conscience of a Nation.” In 1983 it was a scandal (in media circles) that a Presidential first–a book penned while in office–would be “wasted” decrying abortion, a practice as ensconced in our national life as pro-abortion bias was in the journalistic establishment. President Reagan knew otherwise. He understood that intellectually, jurisprudentially, and morally we had dug ourselves into a deep hole. Perhaps most shocking of all to the hostile media, President Reagan unapologetically linked abortion to its evil twin–infanticide. This was not a mere intellectual exercise but reflected a real life-and-death case that had drawn national attention. In 1982 the public learned that the anti-life virus had jumped from the preborn to the child born with imperfections. The President came under a siege when his administration played a key role in the enactment of legislation to protect the right to life of babies born with disabilities. He shrugged the torrent off. Twenty six years before Nebraska passed the historic “Pain-Capable Unborn Child Protection Act,” President Reagan boldly introduced the issue of fetal pain at the annual convention of the National Religious Broadcasters. The President immediately came under a barrage of withering criticism. But a prestigious group of professors, including pain specialists and two past presidents of the American College of Obstetrics and Gynecology, sent the President a letter expressing their strong agreement. I could list dozens of examples of how this good and decent man called upon his fellow Americans to honor the better angels of our nature. Or I could elaborate on policies, such as originating the “Mexico City Policy,” cutting off funds to what was then known as the United Nations Fund for Population Activities because that agency violated U.S. law by participating in China’s compulsory abortion plan, or his support for legislation to challenge Roe v. Wade–to name just three. Let me conclude with this commemoration of what would have been President Reagan’s 100th birthday. Pro-lifers are frequently the target of unfair criticism, demeaning caricatures, and deeply unwarranted assumptions about our motivation. But so, too, was President Reagan, and in a far more vicious manner. When we are under attack, it’s good to remember we are in very good company. I will never forget that first time I heard the President say there are simple answers, but there are no easy answers. The answer to abortion? No! In thunder. But the pro-abortionist will never run out of rationalizations why abortion is always and in every case “necessary.” This always has been and always will be a minority-of-a-minority opinion. Moreover the consciences of a vast majority of Americans are pricked when they hear about abortionists such as Kermit Gosnell, charged with eight counts of murder. [Editor’s note. Gosnell was subsequently convicted of three counts of first-degree murder]. At some level they must be asking themselves what hath Roe wrought? “This is not the first time our country has been divided by a Supreme Court decision that denied the value of certain human lives,” President Reagan wrote. That is our responsibility and our privilege in carrying on the legacy of President Ronald Reagan.